One bad dining experience can stop a student from ever dining on campus again. Though food safety isn’t the hottest new trend, it’s important that colleges and universities are focused on implementing safe dining practices. Careful planning and strong dedication can minimize food contamination on the journey from farm to plate. Along with strict local, state and federal food safety guidelines, higher education institutions should execute additional workplace and environmental safety rules to ensure food safety. 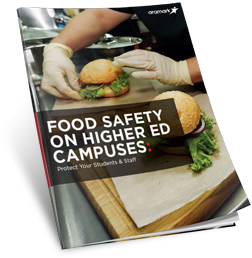 Learn how your campus can protect its diners and provide a safe eating environment in this educational guide.